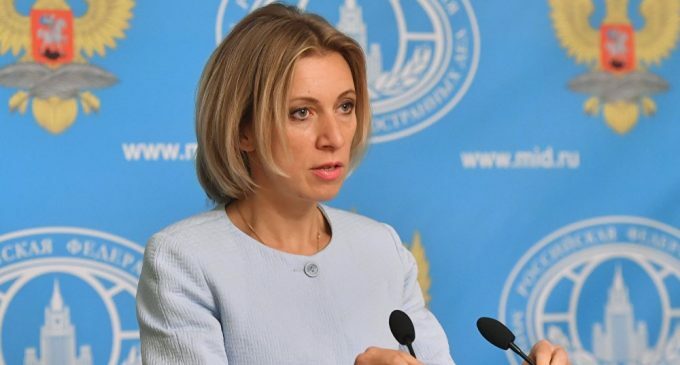 The Russian Foreign Ministry’s spokeswoman commented Monday on German Chancellor Angela Merkel’s statement comparing Crimea’s reunification with Russia to the German reunification. MOSCOW (Sputnik) — Russian Foreign Ministry’s spokeswoman Maria Zakharova commented Monday on German Chancellor Angela Merkel’s statement comparing Crimea’s reunification with Russia to the German reunification, joking that it might prompt the German media allegations on Russia’s ‘hacking’ of an election candidate. On Sunday, the German chancellor said in an interview to the Frankfurter Allgemeine newspaper that accepting Crimea’s reunification with Russia could be compared to accepting the existence of two German states in the times of the German Democratic Republic instead of putting efforts to reunite. “Now, mentioning the Crimean issue and German unification, though awkwardly articulated, is the position of the German government… Not people of Crimea and Ukraine, but people of Russia and Crimea had been divided against their will, which has been proved not only with 2014 referendum, but with referendums and its attempts which took place since the USSR collapse. But on the other side, I am not ruling out that tomorrow the German media would report that ‘Russian hackers’, which are so actively used to threaten the Germans, have ‘hacked’ not servers of the campaign, but a candidate,” she wrote on her Facebook page. Zakharova stressed that Merkel‘s statement was a yet another argument, proving the rightfulness of events in Crimea. “Could have anybody imagined two year ago that the German chancellor would solve the complex Crimean issue by mentioning it in the context of German reunification? Back in 2015, when speaking about the Crimean referendum, [Russian Foreign Minister] Sergey Lavrov said at the Munich [Security] Conference that the ‘Germany’s reunification was conducted without any referendum, and we actively supported this,’ but the audience expressed their resentment,” she said. Crimea rejoined Russia in March 2014 after almost 97 percent of the residents voted for the reunification at the referendum. Ukraine, as well as the international community, has not recognized the move, with Kiev still considering Crimea as an occupied territory. Russian authorities have repeatedly said that the Crimean residents decided to rejoin Russia in a democratic procedure and that the referendum was conducted in compliance with international law.